On November 11, I made the journey from my home in Vancouver, Canada heading south to Seattle for the new education seminar known as BuilSpec. 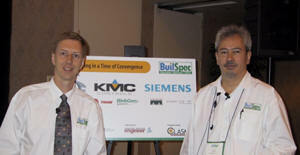 Anto Budiardjo and Paul Ehrlich of Clasma are running BuilSpec on a tour of ten cities across the United States. BuilSpec is a single day version of multi-day BuilConn that is held annually in North America and Europe. I own and operate a consulting firm that specializes in automation and energy conservation, so my mission for this event was to learn about the innovations in automation technology and how they can help my customers. Before the day began at the Crowne Plaza Hotel in downtown Seattle, I was talking with Neil Gifford of WebGen Systems about some of the exciting new projects that I have been working on in Canada. Neil and I have both found that clients are becoming more sophisticated as they begin to look at the life cycle costs of their facilities. Neil says with facility owners like the Bank of America and the University of Miami becoming aware of the co-benefits of energy and client comfort that come with intelligent building systems “the choice is between getting on the train or getting run over by it”. This proved to be the perfect lead into the morning discussions. Paul Ehrlich began the day by describing his vision of the future of facility management systems. The buzzword of the industry ‘convergence’ simply means that a number of different building systems are coming together. The consequence is what counts as building systems such as Security, HVAC, Lighting, Fire Alarm and CCTV can now talk to one another. With these systems integrated into one, there is tremendous potential to do things that we have never done before with buildings. Departments that were previously isolated like Shipping can now be linked directly to Production, or user based systems like Lighting and HVAC can be linked to Security. As these various systems are now integrated over the Internet and Intranets, it is now possible to connect multiple buildings together and tie the whole structure into one common control organism called the Enterprise. 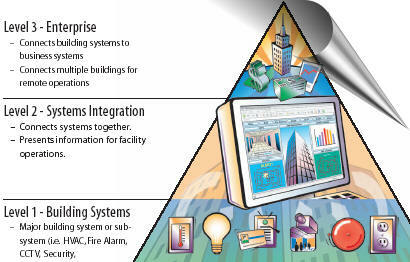 This concept is visually represented with the Facility Systems Pyramid shown here. So now that I understand the value of convergence, Paul brings in a video segment interviewing facility owners and operators from all over the United States. Paul developed a fantastic video link that takes you on a virtual tour of some of the most futuristic facilities in the United States. He takes you directly to property managers, engineering staff, facility operators, contractors and architects so that you get a snappy and professional window into many cutting edge operations. Interviews with Jim Crockett (Editor – Consulting Specifying Engineer) and Mark Golan (Vice President of Worldwide Real Estate – Cisco Systems) are among the many of the stakeholders presented. I really liked the video segments as Paul showed us examples of modern building owners who are seeking out and implementing convergence. After a short break and some fantastic gourmet muffins, Paul brought out the technology. Backbones, Wireless, Internet, fingerprint sensors, IP telephones and how these things will impact your ‘Enterprise’. This session drove home the idea that the IT world is infiltrating facilities, and accelerating their rate of growth. According to the IT laws of the world (Moore’s and Metcalf’s Law), processing speed and bandwidth double every few years. By contrast as Paul says “HVAC automation systems move at the speed of dinosaurs”. This point was the climax of the day for me, 5 years ago data and telephone systems merged to form IT departments, and now IT is converging into all other aspects of facilities and business. The session closed with a glimpse at the future through a video Case Study of Lakeside Hospital in Nebraska. Integrating Security, Nurse Call, Pharmacy, HVAC, Fire Alarm and Patient Tracking systems makes this facility truly interoperable. Lakeside Hospital is the ‘digital hospital of the future’ and is an excellent example of integrating building systems into the Enterprise. The result is that people want to work there, patients want to stay there, making it truly a showcase facility to be proud of. From thumbprint password identification to wireless HVAC and lighting components, this part of BuilSpec made me a believer. After a great lunch, the afternoon began with a detailed overview on interoperable open systems. 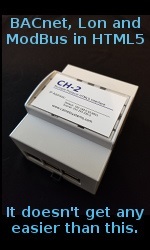 In this section open systems such as BACnet, LonTalk and Internet based protocols were compared in detail with Proprietary Systems. Using each level of the Facility Systems Pyramid, Paul critiques each type of open system based on the ability to satisfy the needs of each level of modern facility operations. Using these criteria, it becomes clear that both LON and BACnet are significantly better than proprietary systems, though each have their pros and cons. Internet based protocols such as XML were also considered, though significant work needs to be done to define communications standards for these systems before they will become viable. After teaching you the diversity, strengths and weaknesses of the various systems that are on the market, Anto challenged us to see if we learned anything. By assigning interactive projects to small groups, we had the task of formulating a design proposal to implement a new Open Facility Management System. This deliverable project engaged the participants and showed us how to implement these technologies by offering innovative new solutions for the modern client. This section was a great afternoon exercise and gave us a chance to talk to the people who were there. By actually designing a system, we saw how the business enterprise can evolve under increasingly difficult operating conditions. It was very interesting to see how different teams tackled the same problem, and how incredibly different the solutions were. I walked away from this with an understanding of the power of these new integrated building systems, and found this to be a great exercise. Finally, Anto described the specification process that will allow the designer or contractor or facility owner to maximize the benefits they can attain from these new technologies. Now that we understand the various pros and cons of the open systems available on the market today, we were able to create a request for proposal to specify the system we want. Design Tools and links to information were provided, as well as a resource CD to help the designer specify an Open System that will meet the needs of the ‘Enterprise’. This section closed off with a short discussion on Green Buildings and LEED certification to identify the important ways that control systems can help the designer to achieve LEED certification. My only criticism of this excellent event is that it needs a different name. BuilSpec leads me to believe that the day is spent in the details rather than the vision of the future that it truly provides, perhaps FutureBuil was already taken. As IT departments become more and more integrated with every aspect of our business Enterprise, the education gained at BuilSpec will help the facilities team to speak the IT language so that we can all work together to create the futuristic buildings that we will need sooner than we can imagine. Anto described BuilSpec as a little ‘speck’ of BuilConn, but in my opinion it was more. BuilSpec allowed designers, owners and contractors who are creating modern buildings in Seattle to get together. In one day, BuilSpec takes you on a virtual tour into the future of business. You learn how information technology is infiltrating every aspect of the structure of today’s business enterprise, and how these changes will impact your operation. Paul and Anto analyse and critique the various cutting edge systems that have evolved to date with a refreshingly unbiased point of view. I achieved my mission to learn about how innovations in the automation industry could help my business and my customers and I highly recommend BuilSpec as an efficient leap into the future of buildings.